Carbon monoxide is a nasty poison because humans can not detect it. Fortunately, inexpensive ($50 U.S.) carbon monoxide detectors are now readily available. Every dwelling or workplace should have at least one. In Lexington, KY, a family of four was killed in 1998 when they left a minivan running in their attached garage. In October, 2004 the same fate befell a family of six in Orlando, Florida. In September 2005, a Beaumont, Texas family of five died from the carbon monoxide emitted from a generator being used to power their home after Hurricane Rita. In 2015, a family of eight died in a similar fashion. In all these cases, a simple carbon monoxide detector would have saved their lives. Any home appliance or accessory that burns fuel is a potential source of carbon monoxide. Ordinarily, when a material such as a hydrocarbon burns, it is converted to water and carbon dioxide (CO2). CO2 is generally harmless, although it can pose certain hazards in high enough concentrations. When a combustion device is not operating properly or has a leak in the exhaust line, carbon monoxide (CO) may form and/or accumulate in living spaces. Examples of such hazards include coal, oil and gas-fired furnaces, space heaters, and water heaters (watch especially for cracks in the chimney liner or flue) as well as wood-burning fireplaces. Non-electric ranges and stoves pose a similar but lesser hazard. Using an internal combustion engine or barbecue grill in a confined space such as a garage, house, or tent can rapidly build CO to dangerous levels and should NEVER be done under any circumstance. Carbon monoxide is not detectable by odor and headache should be taken as a warning that a dangerous concentration is being inhaled. In sudden exposures to high concentrations, weakness and dizziness may be the only symptoms preceding collapse. The amount of carboxyhemoglobin formed in the blood is dependent on concentration and duration of exposure, ambient temperature, physical exertion, health, and individual metabolism. Symptoms are usually not noticeable until the carboxyhemoglobin level reaches 10%. At 10-40%, symptoms may include increasingly severe headache, dyspnea on exertion, decreased manual dexterity, impaired judgement and memory, irritability, emotional instability, dizziness, fatigue, drowsiness, confusion, nausea, vomiting, palpitations, and impaired vision and hearing. With continuing exposure, there is a progressive worsening of all symptoms. At 40-60%, anginal pain, incoordination, hallucinations, lethargy, syncope and collapse, and increased respiration and pulse may occur. At 60-80% there may be decreased respiration, blood pressure and pulse, and deepening coma with intermittent convulsions and incontinence of urine and feces. Rarely, there may be a pink or red skin discoloration, but cyanosis or pallor is more common. Other reported signs and symptoms include increased temperature, dilated pupils, perspiration, muscle spasms, hyperreflexia, aching limbs, and retinal hemorrhage or venous engorgement. Above 70-80%, rapid death from respiratory or cardiac arrest usually occurs. Death may also be caused by myocardial or cerebral infarction. Cerebral edema may also occur. In non-fatal cases or when death is not immediate, primary or secondary effects of tissue hypoxia and some atypical reactions may develop. Safety Data Sheets (SDSs) for carbon monoxide such as this one from Airgas Products are available from virtually every major gas supplier. The toxicity of CO results from its very tight binding to hemoglobin, the species that carries oxygen from your lungs to your bodily tissues. For hemoglobin to work, it can't bind oxygen very tightly (otherwise it couldn't release oxygen at its destination). Unfortunately, CO binds to hemoglobin 200 times more tightly than O2. Carboxyhemoglobin (the molecule formed when CO binds to hemoglobin) does not perform oxygen transport, and it rapidly builds up. In essence, victims are slowly suffocated because their hemoglobin is consumed. The fatal concentration of CO depends on the length of the exposure, air turnover, exertion etc. Levels above 300 ppm for more than 1-2 hours can lead to death, and exposure to 800 ppm (0.08%) can be fatal after an hour. 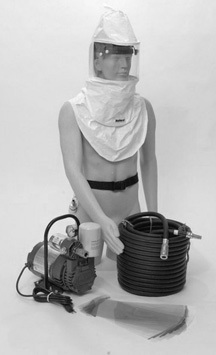 To treat victims of CO poisoning, first remove the victim from the CO-contaminated area. Second, give pure oxygen and seek medical assistance. In some cases, hyperbaric oxygen (2 or 3 atm, as might be used in a diving decompression chamber) may be required to force the carboxyhemoglobin back to the hemoglobin form. You may see carbon monoxide listed as a hazardous combustion or decomposition product. Or you may see the term "toxic oxides of carbon", a general term which includes carbon monoxide. Such dangers are an important part of the fire fighting considerations. Be very careful when using air-line respirators or diving equipment air compressors near exhaust sources which could contaminate the intake air. Even electric-powered compressors that use oil are a hazard as the oil can break down at high temperatures and form CO even though the equipment is powered by electricity! Note that carbon monoxide monitors sold for home use do not meet OSHA requirements for monitoring CO in workplace atmospheres or laboratories. Household monitors are meant to save your life, but they will not alarm at low levels that, if you were exposed to them occupationally day in and day out, could harm your health. See the video link below under Further Reading for more information. Carbon monoxide fact sheet (397 K PDF file) from OSHA. Carbon Monoxide information from the U.S. Consumer Product Safety Commission has all kinds of information including a pamphlet titled The "Invisible" Killer. CO tips from Columbia Gas. NIOSH has a good article titled Carbon Monoxide Hazards from Small Gasoline Powered Engines. Hyperbaric Oxygen Therapy at Medscape. Wikipedia's entry on CO and on carbon monoxide poisoning. Why Residential Carbon Monoxide Monitors Don't Belong in the Workplace, a QuickTime video at the University of Arizona (also available as a Windows Media file). Our chemistry-oriented visitors might like reading about transition metal carbonyl complexes in the Organometallic HyperTextBook.